QUESTION: What was your reaction when writer/director David Ayer first approached you about this project and what drew you in? Did you have any familiarity with the DC Comic? 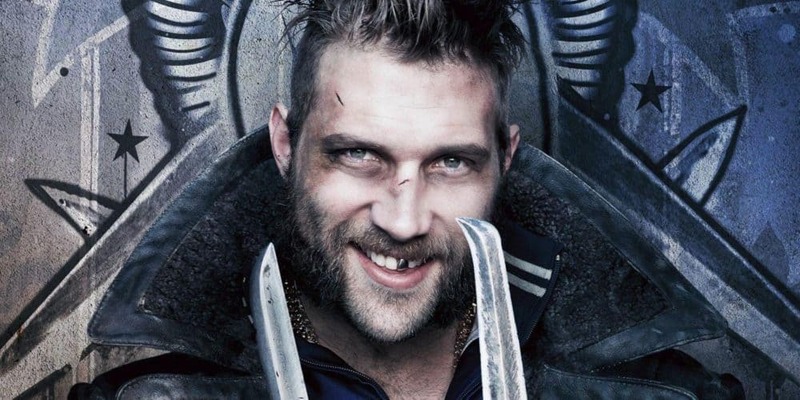 JAI COURTNEY: I had virtually no familiarity at all with the comics but I really wanted to work with David; that was the main reason I got involved. I heard about the project shortly before David called me, and it was actually surprising when I got the call because, at the time, I was focused on working on smaller films and had a pretty clear attitude of what kinds of characters I’d be playing. I didn’t think something like this would be my next move, but, obviously, I didn’t know anything about Boomerang or what it would be. There was no script at the time but it sounded like an exciting opportunity. And I really trusted David’s vision and the work he’d done leading up to this. Also, I couldn’t resist the opportunity to play an Aussie in the DC Universe and would have been heartbroken had the role gone to some other Aussie. In that sense, I’m really grateful for the shot that David gave me, and it turned out to be a project that was hugely surprising. I didn’t know what I was in for, and I’m so glad that he took a chance with me because it’s been one of the most amazing filming experiences in my short time as an actor. QUESTION: How did David communicate his vision for Boomerang, and what was it like creating this character with him? JAI COURTNEY: We started shaping my character really early on, like months out from when we got out to location and started rehearsal. All the actors had to start training for our roles really early. There was a martial arts trainer that came in, which fed into the mentality that we were heading into with this film. We didn’t really get into specifics about the scenes, but we understood from the training that this film was of a certain age and had a certain energy. There was no script for me to read through a lot of this process, but David and I would have these brief conversations about the character. He said to me, ‘Look, I want you to find your inner sh*t-bag; go out and get in as much trouble as you can without getting arrested’ [laughs]. I just said, ‘All right.’ David likes to do this sort of thing – he gives you a bit of a nudge in one direction, but not really. He’s not going to walk himself into a trap where he’s responsible for your actions [laughs] – just gives you this nudge, ‘from one sh*t bag to another’ – and you might understand what he’s talking about. QUESTION: Right, so he won’t be culpable if it ends up in court. JAI COURTNEY: Exactly [laughs]. So, I obviously had fun with that. I wasn’t going to go and get myself arrested, but it was cool to understand the kind of man I’d be portraying just by having that conversation. When I was getting into my character, I drew on influences in my life. I wrote things down; I recorded memories. I thought about guys I’d grown up around and men who were out for themselves – people who would stab anyone in the back or dispose of someone. Through that collage of memories, I was able to patch something together that started to feel like the character we ended up seeing on screen. QUESTION: Boomerang is an expert at his trademark weapon. Was this something you had to train for or did you already have experience throwing a boomerang? JAI COURTNEY: Yeah, obviously, we Australians all grew up throwing boomerangs together [laughs]. But, no, during training, I got familiar with it a little bit and had some fun. I soon realized that I’d be putting a lot of my cast and crew at risk if I took that onto the set, but the boomerangs I threw were a little more user-friendly. QUESTION: Can you talk about the five-week rehearsal period/‘boot camp’ David brought all of you together for prior to shooting? What was that experience like for you and what effect do you think it had on the cast as a whole? JAI COURTNEY: It was amazing! That’s an opportunity we don’t get afforded too often on films. You generally just show up and maybe there are a few fittings and you’re on-camera the following week, so this was incredible. I probably didn’t realize its true value until we were deep into it, but it gave the actors an opportunity to form a real trust amongst ourselves and between us and David. That’s when we really started to dig into the material and get a real sense of what it was that we were making. David wrote this fantastic script, but that almost became the blueprint, in a sense. We were in a room together every day for a month, jamming on anything from personal life experiences to collectively working on the material to draw the best out of the experience that we could. I asked David once about his process, and he told me that it’s what he always does; he realizes the value of it. To him, the more time in which he can get his cast together prior to launching into production, the better, and by the end of it, I understood why. With a property of this size and scale, you’re committing to something that is established and also trying out certain things. When you couple that with the intensive rehearsal process with the training, the weapons, the fight work, the costume tests, there was a lot going on in that pre-production period. And once we started, we couldn’t turn back from it, but it was a really valuable period of time. QUESTION: All of you have such great camaraderie and you all seem to take a lot of playful jabs at each other. Was there anyone in particular who hit you with it the most or was it pretty much a free-for-all, all the time? JAI COURTNEY: Well, no one is exempt, that’s for sure. It was a bit of a free-for-all in that sense, but I think that just speaks to the attitude that we have, which is this love and trust between us as an ensemble. We’re friends, first and foremost. That obviously wasn’t the case before we started working together, but it became a big part of this relationship. Everyone has a sense of humor; no one takes themselves too seriously, and we’re all pretty similar in terms of age and outlook, so it’s an attitude that helps you get through the workday more easily. We just had a really good time making this film and the film itself immortalizes that in some way. We all had a very memorable experience doing it and I think that’s got a lot to do with why we’re all excited to possibly do another one together. Going back and working with these people again is, for me, perhaps the most exciting possibility out of this film. QUESTION: Do you have a favourite scene, or was there a moment during production that was particularly memorable for you? JAI COURTNEY: It’s kind of hard to pinpoint, but there’s a fantastic bar scene that I really enjoyed, and it was something the cast and I rehearsed and worked on quite a bit in the lead-up. I loved the fact that in something as heavily charged and action-packed as this film, we could boil it all down for a second and find that the movie had an emotional crux to it, and explore that. It’s the one chance some of the characters get to explore that side of themselves – Boomerang being one of them – and I just thought that was cool. It’s part of the authenticity that David seeks in all of his characters – he likes to find the heart inside each of them – and I’m glad the film stayed true to that. Despite the fact that the reality is heightened and it’s just impractical to find those moments in this high octane, action blockbuster, we still managed to find a soft core in it somewhere. Suicide Squad film opens on 4 August 2016.